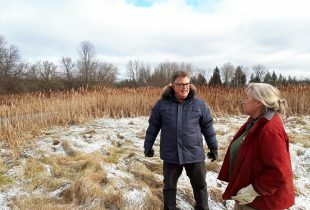 Forty kilometres from Parliament Hill is an area that provides habitat for waterfowl, at-risk turtles and other wildlife. 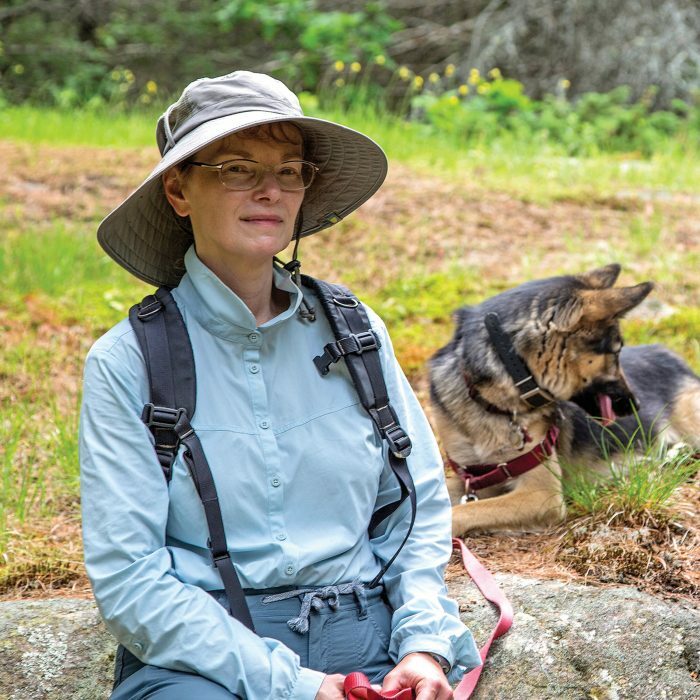 One woman is rallying people to protect it. Sweat collects above Janet Mason’s lip as she navigates her way through thick forest and around diverse wetlands. Eastern Ontario is in the midst of a heatwave. Walking feels like a chore. Dressed in a long-sleeved shirt and pants to protect from ticks and mosquitos, Mason is unfazed by the 32°C temperature. She is in her happy place, exploring the Carp Hills. Mason wasn’t always as committed to the environment as she now is. She also connected with her true passion: conservation. “I was able to self-actualize,” she says. It’s impacting her city for the better. The Carp Hills encompass 10,000 acres (4,046 hectares) of private and city-owned land. 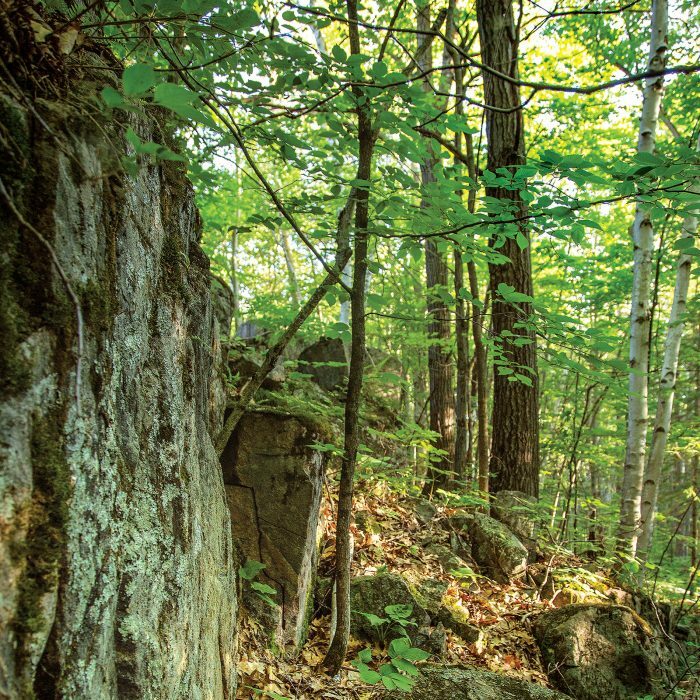 Its forest, wetlands and outcroppings of Canadian Shield are a backdrop to rolling countryside and new housing developments. “It’s the wildest part of the City of Ottawa,” says Mason. She’s not exaggerating. The Carp Hills are home to more than 600 species of plants and animals. Ducks, geese, songbirds, fishers, black bears and moose all live here. And on a summer morning, when light begins to filter through the forest canopy, you can hear its wild residents come to life. Seeing them is trickier. A Blanding’s turtle sunning on a log slips into a wetland lickety-split when a footstep crushes a fallen branch. 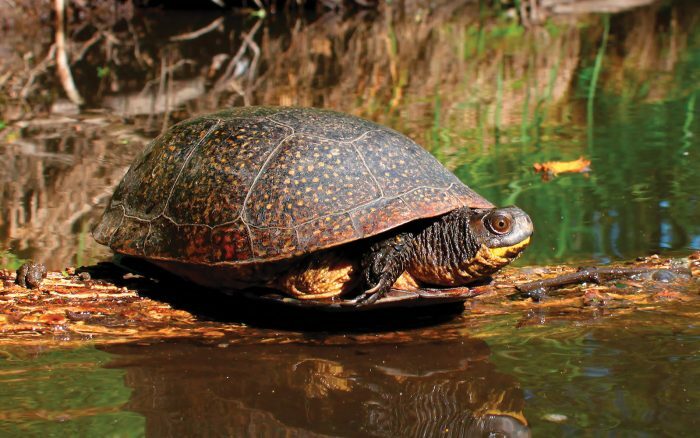 This at-risk species of turtle relies on this habitat. It’s not alone. These hills support people too. Wetlands in the Carp Hills supply clean water to the Carp River via surface streams and underground aquifers. 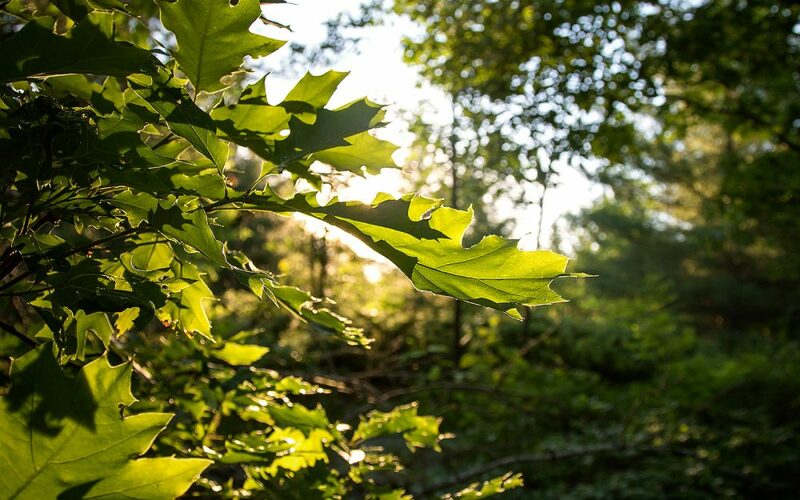 For years, those fortunate enough to know about this place have explored it, reveling in the chance to experience nature, minutes from busy city life. 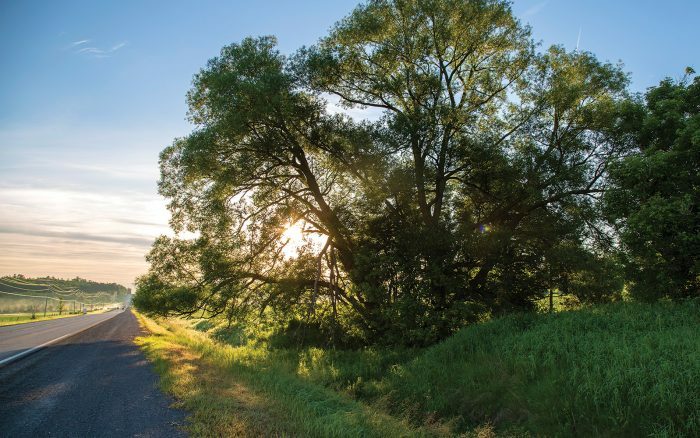 Despite the growing popularity of the Carp Hills amongst nature enthusiasts, there are still many people who don’t know about the value these hills bring to the City of Ottawa. Mason set out to fix that. To raise the profile of the Carp Hills, Mason began networking with environmental organizations. She met Mark Gloutney, Ducks Unlimited Canada’s (DUC) director of regional operations for Eastern Canada, about four years ago. Mason saw DUC as a potential ally in efforts to protect the Carp Hills, and offered Gloutney a guided tour hoping he would come to the same conclusion. “I figured, ‘what have I got to lose?’” recalls Mason. After the tour, Gloutney knew DUC had to help protect this landscape. “Mark took the bull by the horns,” says Mason. Gloutney has returned to the Carp Hills many times since that first visit with Mason. “It’s a beautiful spot. You go, and you see diversity. You see wetlands, forest, deer, woodpeckers. You also see very fragile systems. Old lichen mats and moss that are so delicate and so beautiful,” says Gloutney. And yet, it could be destroyed by development. Between 1995 and 2016, the number of homes in the area has more than doubled, increasing from 332 to 709. Some of these houses—large, beautiful, single-family dwellings—encircle the hills. The most susceptible area for development is the southeastern edge, closest to Ottawa’s urban core. “So that’s where we start,” says Gloutney. He spent three years negotiating an agreement with a landowner to purchase a 440-acre (178-hectare) property. Arriving at a deal was a group effort. DUC, the City of Ottawa, Environment and Climate Change Canada, and private donors funded the land acquisition. The Honeywell family, who owned the property, donated $450,000 of the land’s value to DUC. “This conservation site will be part of the family’s legacy,” says Gloutney. What he leaves unsaid is that this site will be part of his legacy, too. “Mark deserves a huge amount of the credit for making this successful,” says Mason. On April 23, 2018 Ottawa Mayor Jim Watson, Coun. Eli El-Chantiry, local MP Karen McCrimmon, the Honeywell family, Mason, Gloutney, and others gathered at the property to celebrate this conservation achievement. But the story of the Carp Hills doesn’t end here. In fact, it’s just the beginning. Despite their natural value, the Carp Hills are still at risk from unrestricted recreational use. “The hills are a gem…stunningly beautiful,” says Nick Stow. He’s not surprised more and more people want to explore them. The Carp Hills is adjacent to the Village of Carp, on the western edge of Ottawa. Stow, a senior planner with the city, is seated inside Alice’s Café, a quaint restaurant with a wraparound porch along Carp’s main thoroughfare. He lists local attractions and amenities as he enjoys a cup of coffee and a scone. “There’s the annual autumn fair, a farmers’ market, and one of the most popular rural cycling routes is up and through the Carp Hills,” notes Stow. Stow is an ecologist. 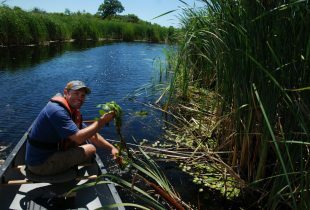 His expertise is in wetlands, rivers, forests, and fens. In his role with the city he identifies critical green spaces, advising elected officials on how these areas should be managed and conserved. Stow is not an expert on local tourism, but he’s been traveling to Carp for more than two decades. In that time, he’s noticed an uptick in people like himself in the area. “As Carp becomes better known, we see a lot more local people, out for the day, enjoying themselves,” he says. Tourism is seen as a boon for any community, but it also comes with challenges. Unknowing tourists hike or cycle through delicate ecosystems in the hills, and unintentionally damage them. The ancient lichen mats could be destroyed by people repeatedly cycling or walking on them. Janet Mason doesn’t plan to let that happen. With other members of her community, Mason has formed a group called the Friends of the Carp Hills. Their mission is simple: keep the Carp Hills wild. With visitors flocking to the area, it’s a job that is becoming more difficult every day. “We realized this place was going to become extremely popular. We asked, ‘how can we protect some places so nature can be at peace?’” says Mason. The Friends of the Carp Hills’ answer was to blaze a new trail…literally. “We created the Crazy Horse Trail,” says Mason. This 6.2-kilometre foot trail on city-owned property in the hills provides people with a place to experience the landscape without accidentally damaging sensitive areas. Volunteers maintain the trail by clearing it and placing signage at key points. Mason’s force is powered by an opportunity to commune with herself, and with nature, in an area she now knows by heart. “Transcendent is beyond or above the range of normal or merely human physical experience. I think that is what the Carp Hills is about to me,” she says. With that, Mason resumes what comes so naturally to her: protecting the Carp Hills. DUC and the Friends of the Carp Hills believe wild landscapes need to be conserved for wildlife and people. DUC is developing a management plan that balances the need to protect the Carp Hills with recreational use. Public consultations with the community and stakeholders will be held as part of this process.